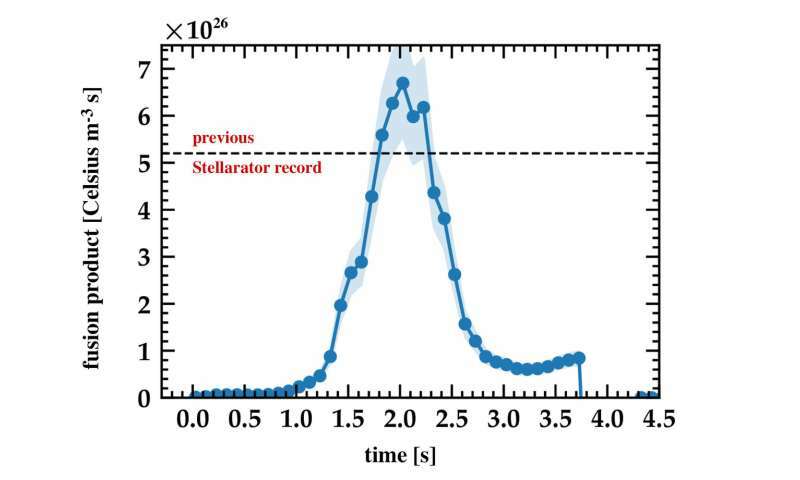 In the past experimentation round Wendelstein 7-X achieved higher temperatures and densities of the plasma, longer pulses and the stellarator world record for the fusion product. Moreover, first confirmation for the optimisation concept on which Wendelstein 7-X is based, was obtained. 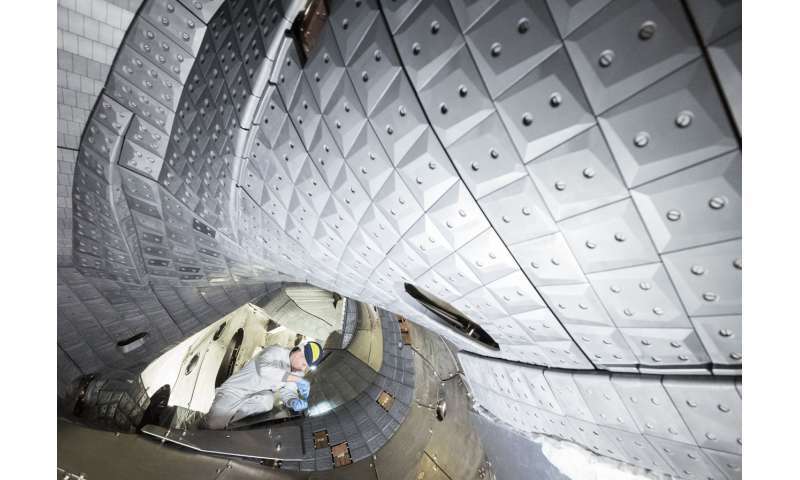 Wendelstein 7-X at Max Planck Institute for Plasma Physics (IPP) in Greifswald, the world's largest fusion device of the stellarator type, is investigating the suitability of this concept for application in power plants. "First experience with the new wall elements are highly positive", states Professor Dr. Thomas Sunn Pedersen. While by the end of the first campaign pulse lengths of six seconds were being attained, plasmas lasting up to 26 seconds are now being produced. A heating energy of up to 75 megajoules could be fed into the plasma, this being 18 times as much as in the first operation phase without divertor. The heating power could also be increased, this being a prerequisite to high plasma density. In this way a record value for the fusion product was attained. This product of the ion temperature, plasma density and energy confinement time specifies how close one is getting to the reactor values needed to ignite a plasma. 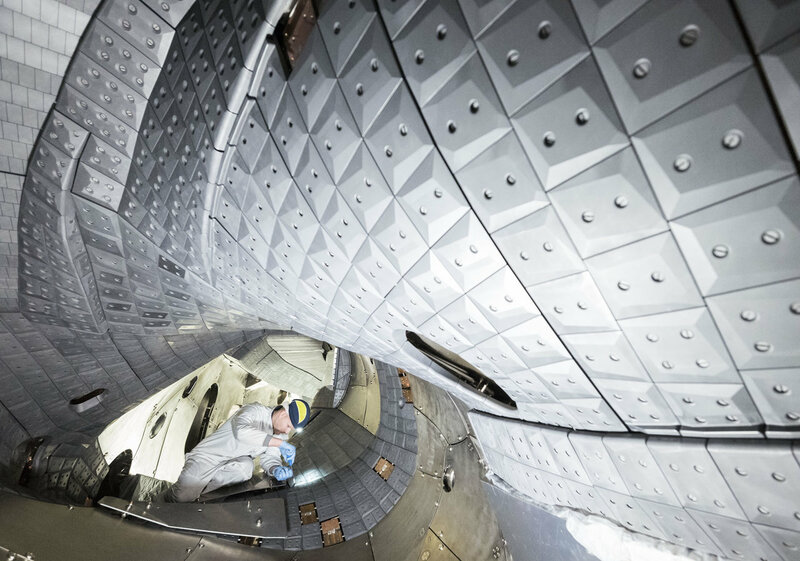 At an ion temperature of about 40 million degrees and a density of 0.8 x 1020 particles per cubic metre Wendelstein 7-X has attained a fusion product affording a good 6 x 1026 degrees x second per cubic metre, the world's stellarator record. "This is an excellent value for a device of this size, achieved, moreover, under realistic conditions, i.e. at a high temperature of the plasma ions", says Professor Sunn Pedersen. The energy confinement time attained, this being a measure of the quality of the thermal insulation of the magnetically confined plasma, indicates with an imposing 200 milliseconds that the numerical optimisation on which Wendelstein 7-X is based might work: "This makes us optimistic for our further work." The fact that optimisation is taking effect not only in respect of the thermal insulation is testified to by the now completed evaluation of experimental data from the first experimentation phase from December 2015 to March 2016, which has just been reported in Nature Physics. This shows that also the bootstrap current behaves as expected. This electric current is induced by pressure differences in the plasma and could distort the tailored magnetic field. Particles from the plasma edge would then no longer impinge on the right area of the divertor. 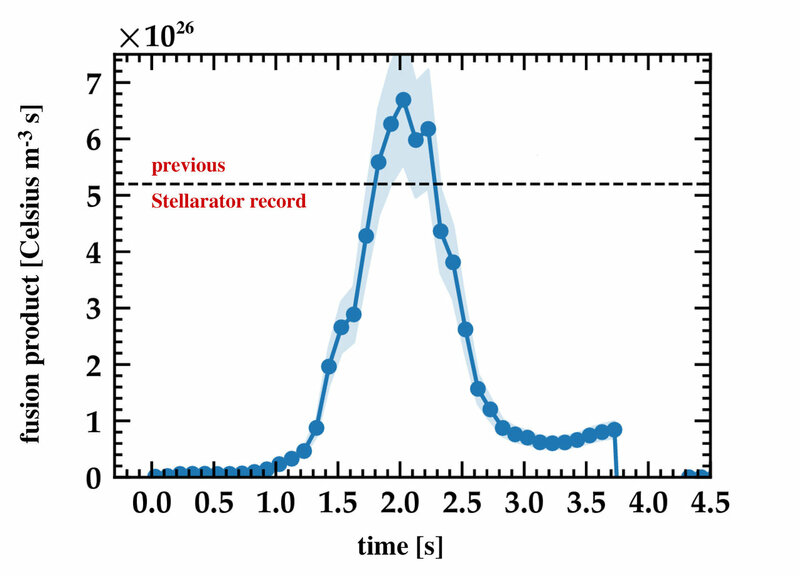 The bootstrap current in stellarators should therefore be kept as low as possible. Analysis has now confirmed that this has actually been accomplished in the optimised field geometry. "Thus, already during the first experimentation phase important aspects of the optimisation could be verified", states first author Dr. Andreas Dinklage. "More exact and systematic evaluation will ensue in further experiments at much higher heating power and higher plasma pressure."